Harry Merrill Hesson, age 85, of Hiramsburg, Ohio, died Sunday, November 25, 2018, at his home. He was born June 11, 1933, in Middleburg, son of the late James Harry and Beulah E. Bettinger Hesson. 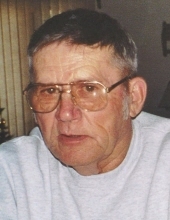 He was a graduate of Dexter City High School, and he was a United States Army veteran, having served from 1953-1955. Harry was a self-employed truck driver. He was a member of the Belle Valley American Legion Post #641, and a member of the Noble County Cruzers, where he shared a love for antique cars. He was known as a hard worker, and he loved his family. In addition to his parents, he is preceded in death by his wife, Esther A. Schott Hesson, whom he married November 29, 1952, and who died January 30, 2017; two sons, James M. Hesson and Gary M. "Doc" Hesson; an infant daughter, Vicki Ann Hesson; one grandson, Stephen Anthony Hesson; and two sisters, Edna Louise Mitchell and Marilyn Jean Heavner. Surviving are his children, Kathy J. Woodhull of Berlin Heights, Stephen M. Hesson of Ava, and Thomas D. Hesson and Ronald G. "Hap" Hesson, both of Caldwell; two brothers, Richard D. (Connie) Hesson of Dexter City and Robert Leland Hesson of Beverly; 5 grandchildren, Darla Reyes, Donna Hesson, Paula Hesson, Megan Guth, and Jonathan "J.D." Hesson; 6 great-grandchildren; many nieces and nephews; his faithful dog, Goldie; and many friends. Friends may call Tuesday, November 27, 2018, from 4-8PM at McVay-Perkins Funeral Home, 416 East Street, Caldwell, where the funeral service will be observed Wednesday, November 28th at 11AM with Pastor Bill Pickenpaugh officiating. A veteran's graveside service will follow at Halley's Ridge Cemetery conducted by the Noble County Veterans Service Organizations. In lieu of flowers, memorial contributions may be made to Noble County Ripples Cancer Support Group, P.O. Box 43, Belle Valley, Ohio, 43717. To plant a tree in memory of Harry Merrill Hesson, please visit our Tribute Store. "Email Address" would like to share the life celebration of Harry Merrill Hesson. Click on the "link" to go to share a favorite memory or leave a condolence message for the family.